Rocky Mountain Mining Camps. “Few would have believed that within a generation this land would be crisscrossed by prospectors in search of gold and silver, that valuable deposits would be found, and that permanent settlement would rapidly follow.” Yet, from the first gold rush into the Rockies in 1859 to the “playing out” of most of the area’s gold fields in the 1890s, a previously unsettled wilderness experienced urbanization and crude camps transformed into cities overnight. In this absorbing history of a number of Rocky Mountain mining settlements, Smith traces the cycle of this frontier phenomenon as camps pop up, experience the uncontrolled booms, and either die with the depletion of their mineral resources or survive as permanent agricultural and mining communities. 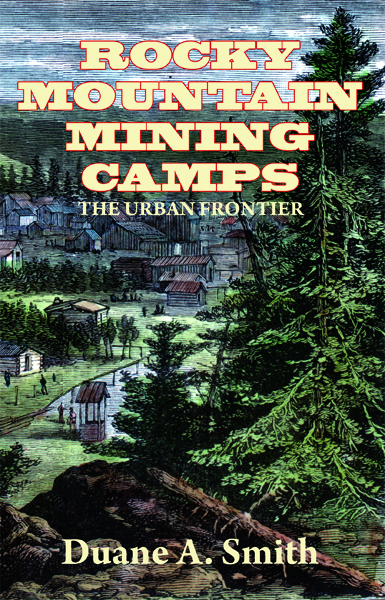 Rocky Mountain Mining Camps – The Urban Frontier, appeals to both scholars and the general public. With lawlessness and vigilante justice slowly yielding to civilized ways – the colorful histories of many mining camps are recounted, linking yesterday with today. In producing this work, Duane A. Smith, professor of history at Durango’s Fort Lewis College, studied in-depth the development of numerous mining camps that existed in America’s early West and Southwest. Other works by Smith that are available through Western Reflections include A Brief History of Silverton, A Quick History of the Durango and Silverton Railroad, and A Visit with the Tomboy Bride.